This brightly coloured Lycaenid is one of two species of butterflies currently known from Singapore, whose caterpillars feed on the young shoots of the forest "weed" Smilax bracteata (although there is still some debate as to whether this plant should be called Smilax setosa.) Whilst it has been recorded on some species of Dioscoreacea (Yam) in other countries in the region, the caterpillars in Singapore appear to prefer the invasive, non-native Smilax vine. 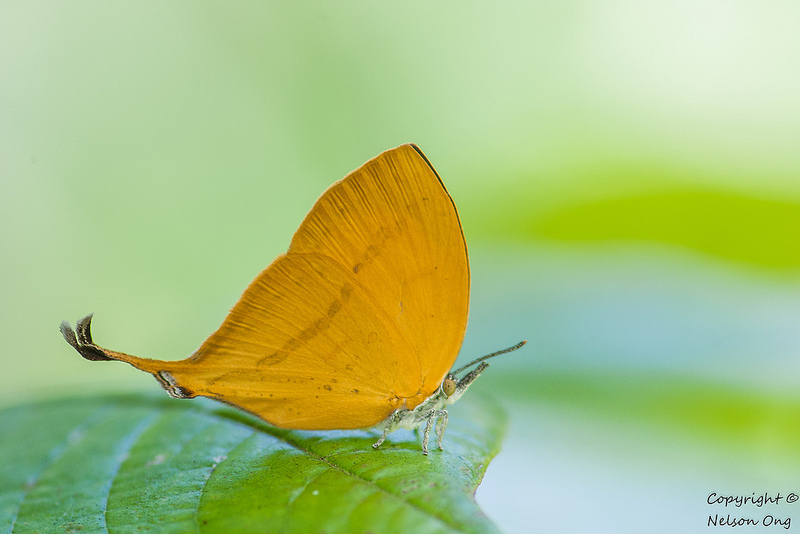 The Yamfly is not uncommon, and is quite widespread in distribution across Singapore, but mainly in areas where the caterpillar host plants are found nearby. This shot of a pristine Yamfly perched on a leaf, was taken by ButterflyCircle member Nelson Ong recently at the Dairy Farm Nature Park.